Sweet tart and spicy rhubarb ginger sauce adds a lovely patina to your meat. Perk up your chicken, pork or ribs! Rhubarb ginger sauce! A Sweet, spicy glaze perfect for chicken and pork! A sweet tart sauce for a flavor accent to your grill, stovetop or crockpot.Full of beneficial health properties and it’s Low-Fat, Low-Sodium, Dairy-Free, Gluten-Free! Our rhubarb bush is full of long stalks of red, ready to eat rhubarb! Needless to say I’m exploring new recipes for this healthy garden veggie. 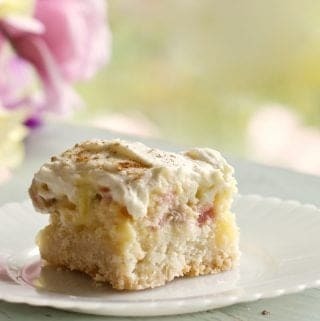 Rhubarb has such a unique, tart flavor it requires some sweetness to compliment it and bring out the juicy clean flavor of this springtime delicacy! 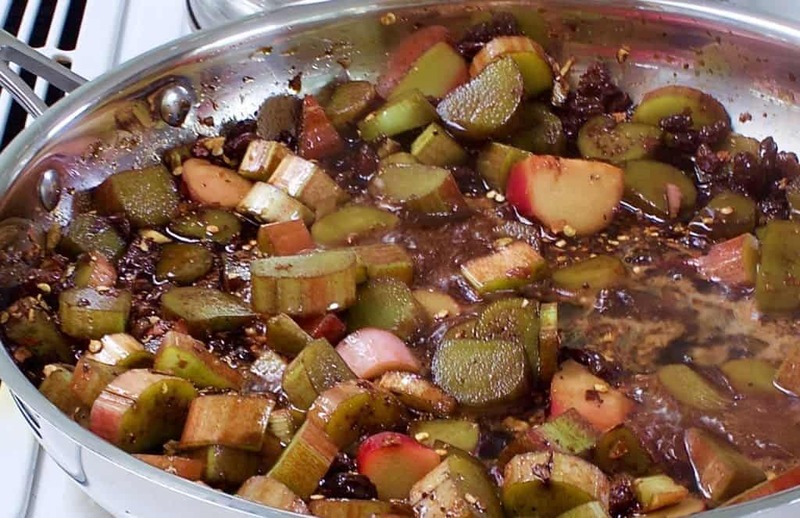 rhubarb ginger sauce is easy to make, versatile and holds up well in the fridge! I found a recipe for rhubarb compote at Bon Appetite. It was a good idea post for me. I incorporated some of their recipe ideas into my own rhubarb sauce that our family loves. Thank you Bon Appetite! This sauce, full of healthy and good for you ginger and rhubarb, goes together quickly and simmers to a thick sauce in about a half hour. This is a spicy sauce unless you choose to tone down the red pepper flakes. 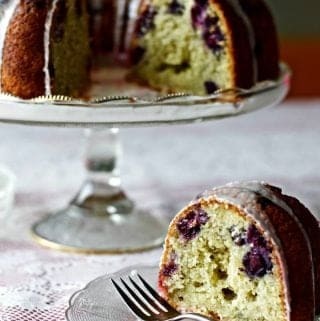 We love it as the recipe is written but if you let it sit in your fridge for a week or so the flavor will concentrate. So beware! This sauce would work well on wings or for the grill! Use it as a chunky barbecue sauce. 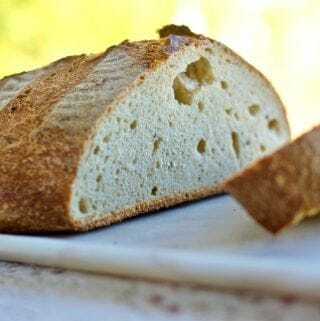 Don’t want the chunky texture? Run it through a blender for a pulse or two (don’t over do this or you will get a bubbly, runny sauce). Make it into a marinade! The possibilities are huge! I have used this sauce several times since I created this recipe. I made pan fried Rhubarb chicken and a slow cooked pork and bacon dish that were MADE by this sauce! By that I mean the sauce added a unique and irreplaceable flavor enhancement to the meal. Yum! It’s been called the ugly sauce. But it is a delicious sauce! Make is a meat marinade. Great for pan frying chicken or pork and yummy in a crock pot! Rhubarb Ginger sauce is thick and rich. Ready to change up your favorite meaty meals. The method is very straight forward. Chop up the rhubarb and mince the ginger. (I didn’t peel my ginger). Add everything into a large skillet and bring to a low boil. Simmer until the sauce thickens, about 20 minutes. This recipe makes about a quart of sauce. It will keep well in the fridge a week or so. Freeze some of it for later if you don’t need it all for your recipe. Remember the flavor gets stronger as it ages. Beautiful if you love the spice. If not, use it right away or reduce the spicy heat. 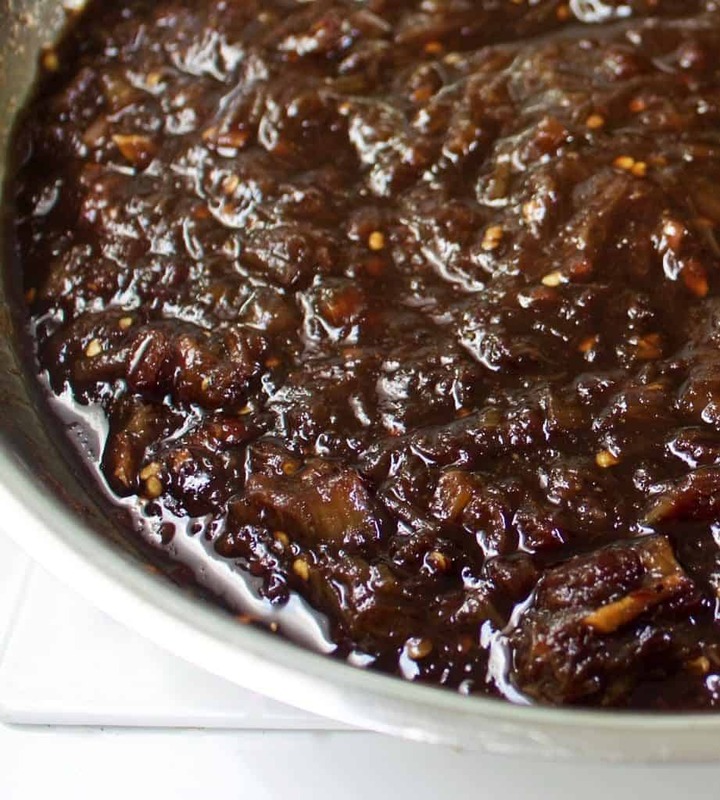 A sweet and spicy compote. Great over chicken and pork! Add this thick rich accent to your favorite slow cook meat dinner or in a gravy boat on the side at table for a delicious flavor enhancement! Add all of the ingredients into a skillet on low and stir them together with a wooden spoon. Turn up the heat to medium and cook until the rhubarb is mushed and the liquid is reduced to a thick , saucy consistency, about 20 minutes. Pour into a quart sized air tight container and store in the fridge until needed. 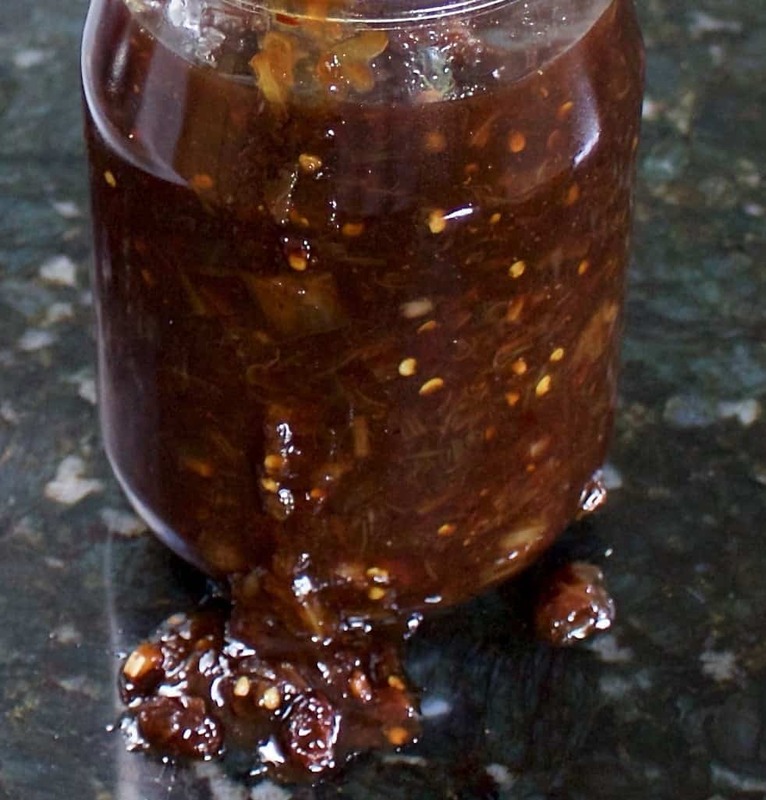 This compote has a little kick from the ginger and red pepper flakes. Adjust the seasoning according to your personal taste. The will increase as the compote is stored. Keeps well in the fridge for at least a week! I have tons of rhubarb in my garden and am wondering if you feel it would be ok to can this sauce? 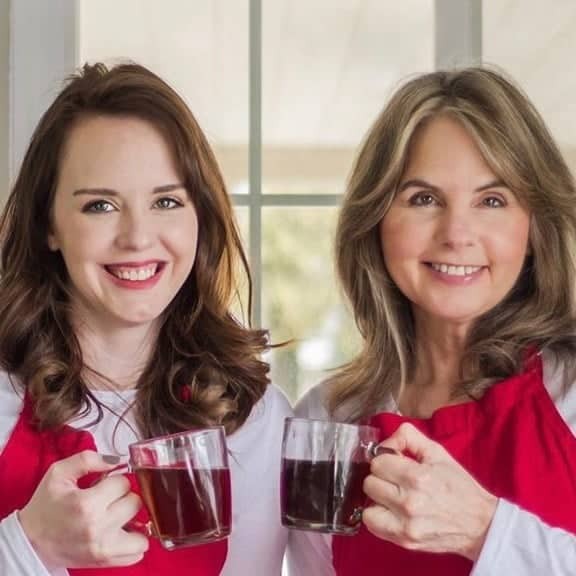 Hi Tammy, I am sure this sauce would be great for canning. Enjoy! This sauce looks amazing! I have never cooked or baked with rhubarb before. 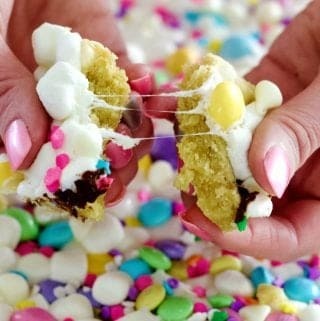 Totally want to try this recipe! Thank you Christine! This rhubarb Ginger sauce IS amazing. I totally fell in love with it and am dreaming up lots of ways to use it in my springtime meals. Thanks so much for stopping by!